Faneuil Hall was built in 1742 as a gift from a wealthy Boston merchant, Peter Faneuil. It was rebuilt in 1762 after a fire. The following year, over 250 years ago, James Otis dedicated Faneuil Hall, home of many great Boston Town Meetings, to the cause of Liberty. 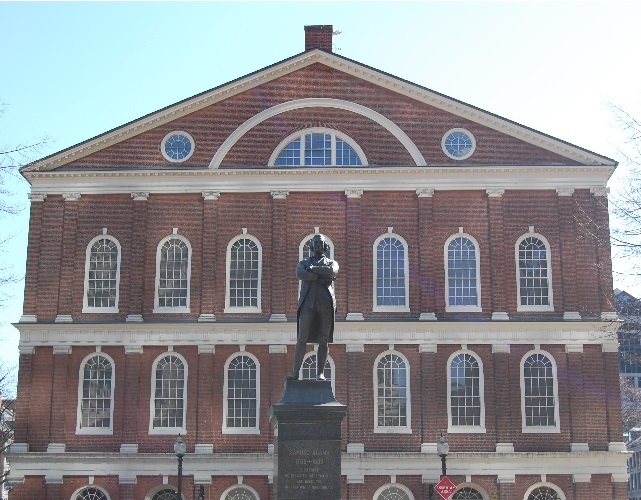 Many of Samuel Adams’ famous Patriotic words were spoken in Faneuil Hall. Today, Faneuil Hall is the center of a marketplace and festival area. Upstairs at Faneuil Hall, Great Hall is well-preserved, and is a remarkable hall to visit if you understand the history. It is free to enter and open daily from 9- 5. A visitor center also opened in 2012 on the ground level with shops and information.